Abby Wolpren for MSUM goes for the kill in the match against Upper Iowa on Friday. Wolpren had 10 kills as the Dragons swept the Peacocks in three sets. Coming off a busy week in Northern Sun Intercollegiate Conference action, the MSUM volleyball team is on a two-game winning streak with just a handful of games left in their season. The team started the week on Oct. 22 when the Dragons travelled to Aberdeen, S.D., to face Northern State in NSIC action. The Dragons fell in three sets. Coming off a short turn around, the Dragons stepped on the court to play Upper Iowa on Friday. Bringing a 5-7 NSIC record into the weekend, the Dragons were looking to get back into the win column. Lead by strong play from sophomores Kaitlin VanWinkle and Abby Wolpren, the Dragons defeated the Peacocks in three sets. “We established our middle and right side attack,” head coach Tammy Blake said. This was the second time the Dragons played the Peacocks with both matches going MSUM’s way; each match was a sweep for the Dragons. Coming off the Friday night victory, the Dragons looked to continue their winning ways against Winona State on Saturday. The Dragons and Warriors faced off earlier this season at the Winona State tournament, with the Dragons prevailing with a five set win. It wasn’t the same case when the teams squared off again. This time the Dragons dominated the match winning their second straight match in straight sets. “We are playing together more and with more confidence,” Blake said. 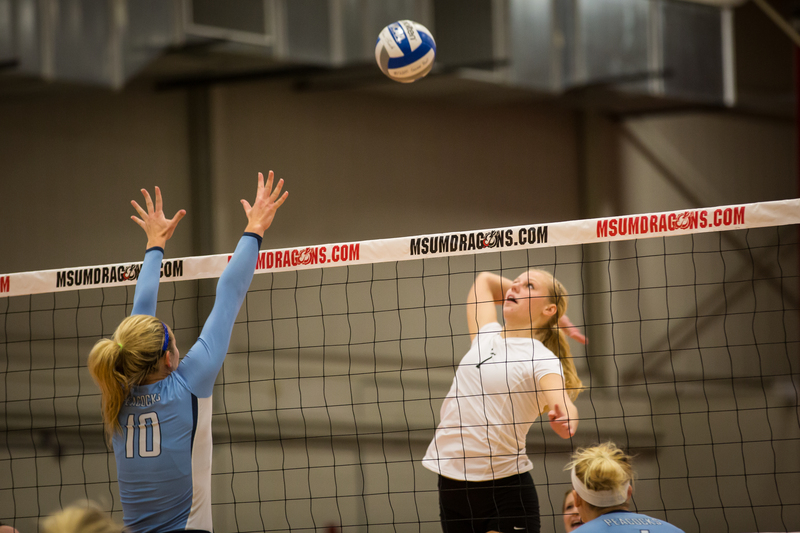 In the match against Winona State the Dragons were led by sophomores Morgan Gradishar and Amber Krenske. Both players had solid defensive games with 17 digs each. Blake said the team’s passing and blocking were key to the Dragons’ victories over the weekend. With the two NSIC victories, the Dragons now have a 7-7 conference record and are looking to get into the conference tournament. The top eight teams in the league qualify for the tournament; right now MSUM is tied for seventh with Minnesota Crookston. “Our focus is on getting into the conference tournament and having a winning record,” Blake said. The team does have some minor injuries plaguing them but are back to playing the way they were in the beginning of the season. ith only six conference matches left, each one is cruicial. “We play in a really strong league, and you need to bring your ‘A game’ to each match and each point otherwise you’re going to get beat,” Blake said.